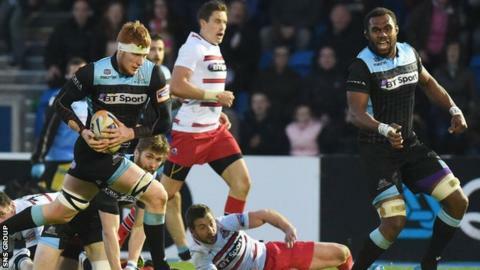 Head coach Alan Solomons thinks it is unfair to expect Edinburgh to match the recent achievements of Scottish rivals Glasgow Warriors. Glasgow were runners-up in the Pro12 last season, while Edinburgh finished eighth in Solomons' first campaign. "Any comparison at this point is odious," Solomons told BBC Sport. "We are in a different situation. They have had stability for a number of years, we are rebuilding. I don't think any form of comparison can be made." Solomons improved Edinburgh's league position by two places, although results remained exactly the same, with seven wins and 15 defeats. And the South African has been criticised for his recruitment policy, with a number of foreign imports being brought to Murrayfield over the past year. But Solomons insists the priority is to focus on young Scottish players. "We believe we have laid the foundation for the rebuilding process," he explained. "The vision is to build a sustainable club through the medium of our indigenous players. "I don't believe in building a team, I prefer to build a club. Youngsters cannot come into a team that lacks experience and the ability to be successful. "Chris Dean (20-year-old centre) playing with Andries Strauss made a massive difference - Chris himself says so. That is why the players are brought in. That is the strategy of the recruitment. "The future of Edinburgh - if we stay on the right track - is bright, because we have some very good young Scottish players. I have no doubt we will show progress this year." As for Glasgow, head coach Gregor Townsend believes his side can use the hurt of last year's final defeat to Leinster to go one better this season. "It's a great motivator," he told BBC Sport, reflecting on a one-sided 34-12 loss in Dublin. "We now know what it's like to be there, and we definitely want to be back there again." Townsend, who won 82 caps for Scotland between 1993 and 2003, also thinks the Scottish game is on an upward curve after a difficult period. "In the last few years there has been a real investment in the pro game," said the former British and Irish Lions fly-half. "Financially, the union is in great shape. Pro rugby is here to last now, and there is real momentum building, especially with us. There is a lot to look forward to." Edinburgh begin the new season away to Munster on 5 September, while Glasgow host champions Leinster on the following day.